We congratulate the winner of the National Motorcycle Museum’s 2014 fundraiser motorcycle, a 2014 Indian Chief Vintage. Our officials pulled a ticket from Thomas Lock of Bern, Kansas. We called and gave Thomas the good news. Tom has been a J&P Cycles customer since the mid-1990’s, says J&P Cycles is about the only place he can get right parts for his Harleys. He’s a machinist by trade and builds extruding machines, so knows what makes a good motorcycle. The Indian will be an addition to Tom’s stable which already includes three motorcycles; a 1953 Harley-Davidson FL “Panhead,” a 1988 Harley Soft Tail and an 1100 Sportster. So the new Indian will be in good company. This was not the first year he donated to win a Museum fundraiser bike. And Tom donated to win twice this year; he donated for six tickets in the summer, then six more in the final mailing just a few weeks ago. He visited his nearest Indian dealer back in November and was impressed by the new Chief, hoped he could win it. 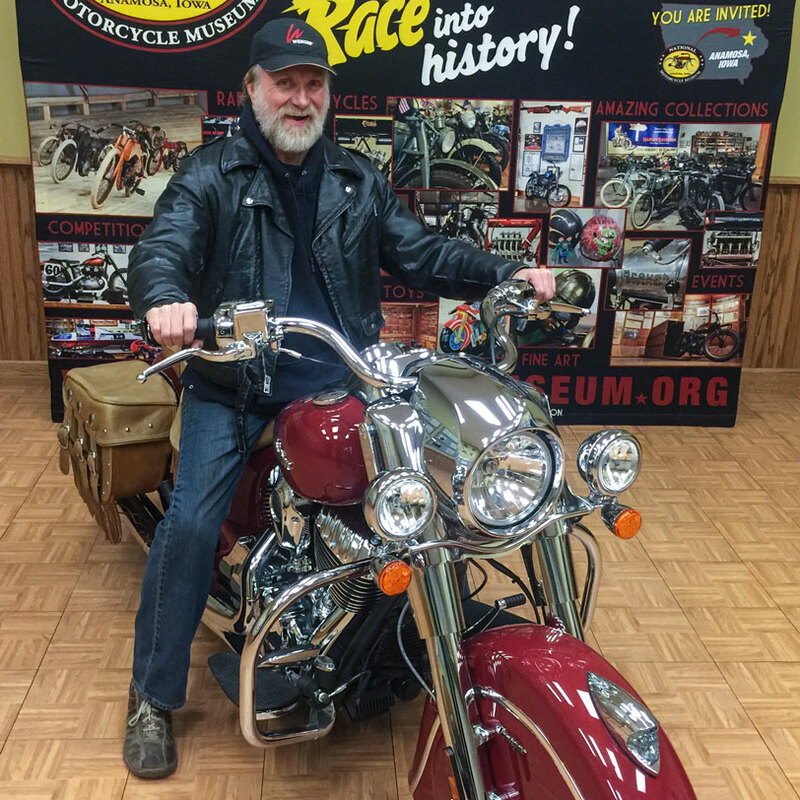 The 2014 Indian Chief Vintage is currently in the lobby at the Museum, but Tom plans to come by soon to pick it up and take it to Indian Motorcycle Lincoln in Lincoln, Nebraska for setup and to complete paerwork. Though he has been a Museum supporter for several years, he’s not yet made the trip to see the actual Museum, and says he looks forward to the visit.